When you picture the great rock guitarists — Jimi Hendrix, Bob Dylan, Eric Clapton, Ronnie Wood — you picture them with a sunburst guitar. Finished with that vibrant colour burst from bright yellow to dark red and black, a sunburst of pure energy and powerful stage presence. The Steinway & Sons Sunburst Collection is a tribute to the great rock musicians that shaped an era and continue to inspire future generations. The classic sunburst finish graces the inside of the fallboard, while the Steinway & Sons classic black lid reveals its inner rock star when opened to amplify the music. Two classics are merged in a symbiosis and as the sun rises: Sunburst. The sun is exploding. STEINWAY & SONS SUNBURST is limited to 69 pianos worldwide, celebrating the year 1969: the year in which Woodstock took place, when the Beatles released their legendary album Abbey Road, and when Led Zeppelin debuted. Sunburst is available as a Model B and as a Steinway & Sons Spirio, the world’s finest high-resolution player piano featuring the company’s proprietary software. 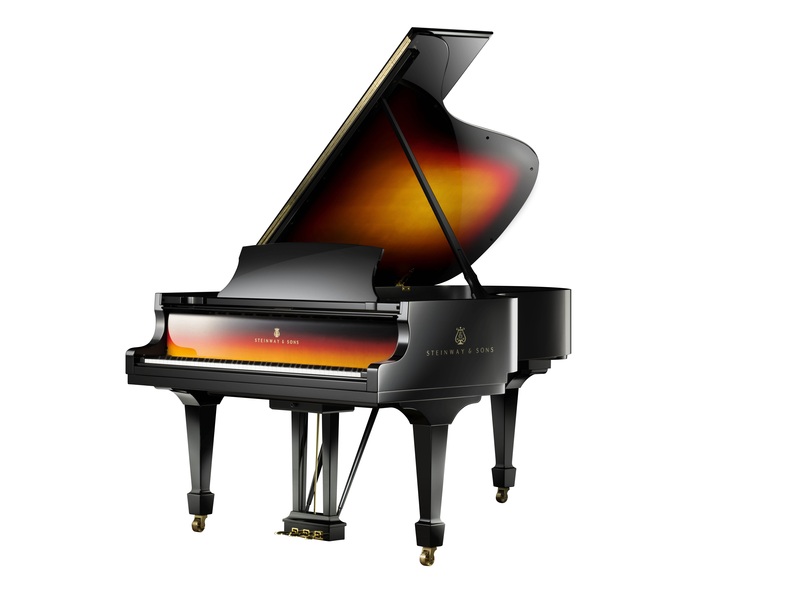 The Sunburst Collection is also available as a Steinway & Sons Spirio, the world’s finest high resolution player piano. A masterpiece of artistry and engineering in your home, Spirio enables you to enjoy performances captured by great pianists — played with such nuance, power and passion that it is utterly indistinguishable from a live Performance. Spirio, a handcrafted Steinway like all others, is the next step in STEINWAY’S history of ceaseless improvement in its mission — declared by Henry E. “to build the best piano possible” — and brings the unparalleled craftsmanship of the Steinway to your home coupled with cutting-edge technology and the peerless musicality of Steinway Artists. The B-211 is our most popular salon grand. Professional musicians and ambitious amateur players alike are thrilled by the richness of its wonderful timbre. The Model B grand piano is ideal for international music schools and studios and forms the musical centrepiece of countless private homes. Perhaps this precious possession will soon become your very own family heirloom. A perfect alternative for smaller rooms is our A-188 salon grand. This magnificent 211 cm grand piano is often referred to as “the perfect piano”. It’s a wonderfully balanced and versatile piano that does extremely well in intimate settings, teaching studios, and mid-sized venues.